While life with a new baby may seem like a constant roundabout of eating, sleeping and nappy changing, there is a huge amount of play going on. Tickling toes, eye contact, sing-song voices and splashy bath time are just some of the ways you are helping your baby to develop through play. * using sound and colours to help to develop focusing skills. Between three and six months your baby will begin to gain control of head and arm movements which will enable them to control actions such as grasping, rolling, supporting their upper body, reaching and swiping at moving objects. At this age they will begin to locate sounds and start to co-ordinate hand and eye movements, recognising people and objects at a distance. Importantly your baby will become more social, displaying a smile and using more expressions to communicate with you. Being more social will lead to an enjoyment of playing with others and they will become more able to kick and grab for things. Most babies will want to explore and play with objects and most certainly will try to put almost anything in their mouth! This is fine as long as you have ensured that the toy is appropriate for this age group (there are no small parts that could be swallowed). As your baby becomes more aware of their environment they will enjoy playing with things they can touch and interact with. 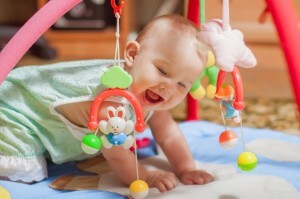 Baby gyms, which have objects dangling down, are perfect for their flailing limbs, as the various noises, and textures of the objects they collide with will be entertaining. These types of toys will encourage the movement of arms and legs and strengthen backs and necks in preparation for your baby starting to crawl. Music is also very important at this stage of a baby’s life as it can lay the foundations of language development. Anything with a rhythm will be welcomed, with upbeat music used to stimulate the baby, and softer music used to calm and soothe the child. Play beak-a-boo – because it is fun! Up to nine months of age your baby will continue to explore objects with their hands and mouth. They will develop more understanding of distance as their vision improves. They will start to sit unsupported and stretch for things that are out of their reach and eventually support their own weight. Your baby will develop more social understanding; responding to their own name, recognising the word “no”, and grasping emotions by the tone of voice. They will start to respond with sounds and the variety of sounds will increase to express their own emotions as they begin to communicate with you. Helping babies to develop muscles to aid sitting up and crawling is important at this time. This can be within a play gym that allows a baby to sit up, or indoor strollers or bouncers that help build up their leg muscles! They will also be teething, so textured toys, that are designed to go in the mouth, can be both soothing and enjoyable for your baby. Children are too young to play together at this age but you cannot start socialising them too early as social development is a key indicator of future success. Try to get together with other carers and help the children to interact with each other. Encourage turn taking, sharing and cooperation with playmates using musical instruments, balls, dolls and teddies. Reading and talking aloud to your child will help them to start building the foundations of speech and language. When buying any toys for the under 3s always ensure you have checked the safety advice on the packaging. At this age children put things in their mouths and toys that have small parts are dangerous as they can cause choking. 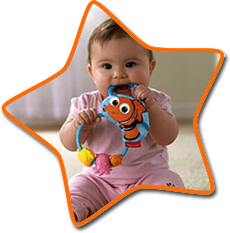 Avoid toys with a warning “not suitable for 0-36 months” and if you have older children in the house keep the toys separated to avoid your baby swallowing small parts from older toys.